Our panel of chefs and cookery enthusiasts collaborated to design a set that provides the most practical and useful assortment for accomplished cooks. These six pieces and four lids all possess rustic, durable cast iron handles. Copper bodies ensure even heat distribution for accurate regulation of temperature, while the stainless steel interiors assure an intensely pure cooking experience. Easy to maintain brushed surfaces are a feature exclusive to Falk Culinair. Professional quality copper cookware and a multi-piece discount too! 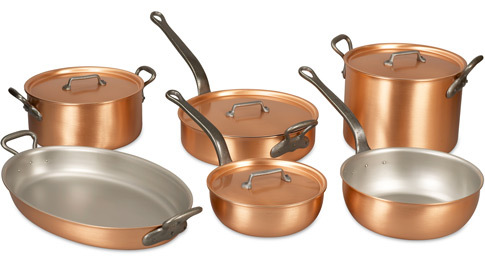 We know you'll love this	copper chef's set	as much as we do. Best cookware available! For some people cooking is more than just a hobby; it's my passion. Although top quality equipment will not necessarily make a good chef, in my opinion it certainly helps. That is why I chose this set from Falk Culinair. Every item is beautifully constructed and easy to clean. A couple of these items have seen plenty of use over the last six months yet show no signs of wear at all. P.s. Great job on the new website! Exactly what I was hoping for! I really like my new pans - no, in fact I LOVE them!